Honorable Robert Walter Kiesnowski Jr. The Seventeenth Judicial District Commission on Judicial Performance unanimously recommends that Judge Robert Walter Kiesnowski Jr. BE RETAINED. Judge Kiesnowski was appointed to be a judge in the Seventeenth Judicial District by Governor Bill Ritter. His term began January 1, 2011. 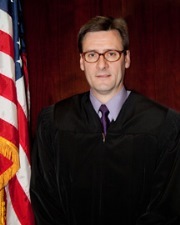 Judge Kiesnowski received his undergraduate degree from Regis College in 1987 and his Juris Doctor from the University of Puget Sound School of Law in 1990. Much of his legal career was spent in private practice. Immediately prior to his appointment he served as in-house counsel for the Denver Police Protective Association. Judge Kiesnowski’s case load during this election cycle was 97% civil matters, and 3% were juvenile, mental health, or criminal cases. Judge Kiesnowski has now been rotated to a criminal docket as part of the District’s regular docket rotation. The evaluation used by the Commission included a review of legal opinions authored by Judge Kiesnowski, a personal interview with the Commission, in-court observations by Commission members, and a review of Judge Kiesnowski’s self-evaluation report. Surveys distributed to both attorneys and non-attorneys associated with cases assigned to the judge provided statistics that were integral in assessing Judge Kiesnowski’s effectiveness. In general, the Judge enjoys a strong approval rating by those he’s interacted with in his courtroom over this past term. Judge Kiesnowski’s ratings from both attorneys and non-attorneys are slightly higher than average for all district judges standing for retention in 2014. Of attorneys responding to the survey, 84% recommended to retain, 8% not to retain, and 8% made no recommendation regarding retention. Of non-attorneys responding to the survey, 96% recommended to retain, 0% not to retain, and 4% made no recommendation regarding retention. During his interview, Judge Kiesnowski recognized his staff as integral to his ability to maintain control in a high work load environment. He received high marks for his case management abilities, communications skills, fairness, and courtroom demeanor. Based on its review of post-case surveys, courtroom observations, several of Judge Kiesnowski’s decisions, and interview of Judge Kiesnowski, the Commission unanimously recommends that Judge Robert Walter Kiesnowski Jr. BE RETAINED.